We live in a digital age. Our lives, our jobs, and our financial transactions are all primarily undertaken in an online atmosphere. So, it stands to reason that as we become more technologically reliant, criminals will take to the digital world in an attempt to illegally profit. Cyber crime has become a widespread global issue, with hackers gaining access to the bank accounts and personal information of over 15 million US citizens and businesses every year. Through identity theft, hackers gain access to your financial information and make fraudulent purchases on your credit cards and bank accounts. It’s important that we understand these threats, how they infiltrate our systems, and what we can do to defend against them. One of the most dangerous cyber threats in existence is known as keylogger malware. Keylogger malware is perhaps the most common and damaging form of malicious software that hackers are currently using to gain access to your most vital information. A keylogger will keep a record of every single keystroke that you make. This becomes increasingly problematic given the large amount of sensitive personal materials we enter into a computer, smart phone, or tablet every single day. Keyloggers keep track of keystrokes from both online and offline programs. So, everything you enter into a website and search engine is tracked with the same attention as offline programs like Microsoft Word and Excel. Once installed on a computer, keylogger will keep a log of your actions, either storing them locally or sending them via the internet to the hacker who created it. If stored locally, the hacker would have to gain access to your computer in order to retrieve the collected data. It’s important to note that there are keylogging programs that can be purchased and installed, either by businesses looking to monitor their employees or parents seeking to control the internet activity of their children. While these programs are keyloggers, they are not malicious in nature and are controlled by the purchaser. How Does Keylogger Malware Get on my Computer? Keylogger malware most often comes in the form of a trojan horse. It is attached to an otherwise harmless program, which you download. Then, once it is in your system, the keylogger begins to gather your information, completely undetected and unknown to you. Keyloggers tend to go unnoticed by antivirus software, slipping through the cracks and wreaking havoc on your system. Most keyloggers come as a part of an EXE file. Since avoiding EXE files are impossible, it’s important to know what site you’re downloading from, and if it has reputable scanning services available. What Information Can Keylogger Malware Gather? Usernames and Passwords: Any site with sensitive information is likely password protected. It’s always important to create strong and memorable usernames and passwords to protect your most valuable info. Keyloggers negate the privacy of your well thought out passwords, transmitting them to hackers who can then access everything from your social media accounts to your email, e-commerce, and banking information. Financial Information: Perhaps the greatest threat of keyloggers comes in the form of lost banking information. By keeping track of your login info, hackers have access to not only every financial transaction you’ve undertaken, but to the funds included in all of your accounts. With this information, a hacker could make fraudulent charges or transfer all of your money away with the click of a button. 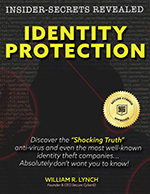 Identity theft creates global losses of over $50 billion every single year. Trade Secrets: If you are a business owner, all of the information pertaining to the inner workings of your company could be compromised by a keylogger. Every email, every financial transaction, the inner workings of your website, and proprietary secrets could fall victim to invasive hacking attempts. How Do You Protect Against Keylogging Malware? Most websites will tell you that the best way to defend your system against malicious keylogging programs is with a strong antivirus program, but that is not enough. There are one million new viruses detected every single day, and antivirus programs are not able to keep up. The best way to combat keylogging malware is with anti-keylogging keystroke encryption installed on your computers and mobile devices. This works better than a one size fits all antivirus program, targeting keyloggers directly and protecting every stroke of your keyboard. Secure CyberID is the only company that offers proactive plans to protect multiple adults across various devices. Contact us today for more information on how to stop hackers before they invade your life and steal your identity.